Hands up if you remember Transport Direct - www.transportdirect.info. It was a journey planner for British transport - all of it, everywhere. Roads and traffic, rail journeys, cycle routes, foot and vehicle ferries, you name it. It included and integrated a huge volume of data from hundreds of sources, put it all together in one place, and made it searchable. It was funded by the Department of Transport, the Scottish Government and what was then the Welsh Assembly, now the Welsh Government. There's a detailed account of its history and context on Wikipedia. It closed for good this week (last Tuesday, 30 September), after a Department for Transport review concluded that there are plenty of equivalent services provided by the private sector. The reason I'm flagging up its closure here is because it's a good example of what happens when you make data open. Regular readers will know that we're big fans of open data here at GDS. In fact, we're fans of open everything. One of our design principles is make things open, it makes them better. In this case, opening up the enormous transport information database in recent years allowed hundreds, even thousands of services to bloom. Services you probably use on your smartphone, or in a web browser, every time you plan a journey, switch on your satnav, or buy a train ticket. Government should do only the things that only government can do. In this case, government had the data, and the sensible thing to do was open it up, make it available, and see what the rest of the world can do with it. As it turned out, the rest of the world made a bunch of transport planners and searchable timetables and ticket-buying apps that were far, far better than anything government could have done. We made things open, and that made them better. Of course, there will be some people who are sad to see Transport Direct go, not least the team responsible for building and maintaining it, for whom I have nothing but the greatest respect. They built a genuinely useful web service that was way ahead of its time. And in that sense, it was a success. It demonstrated a need and paved the way for where we are today, but now we need to move on. It’s now a service that government does not need to provide. The money spent on it can now be spent on other things - things only government can do. Do these spin doctors think we are all stupid. There is nothing to match TD out there; nothing that integrates all the possible modes of travel from A to B allowing one to make a sensible choice, and to plan ahead taking account of known travel difficulties on the proposed day of travel. Where do I now find out what the projected traffic levels on a bank holiday several weeks hence are? The Land Registry website has suffered the same effect; the old site closed and the useful information now buried in a superfluity of self-serving , bean-counting documentation on the gov.uk site. How many couriers in this country would pay for an App like M8 ? With the rapid expansion of home delivery (ebay, amazon, home shopping etc ) here is a market for some entrepreneur to fill. sadly no other service out there comes close to transportdirect, none of them integrate all modes and none let you adjust things like interchange times. So now you have to fiddle with about four sites to get the same information in about 20 mins you could get in 1 minute using the old site. Still missing Transport Direct!!! SO much time I have wasted since Transport Direct closed, particularly trying to plan journeys that involve multiple forms of travel. The Govt says it wants to encourage people to walk parts of their journeys - Transport Direct was and is the only site that offered usable information. Walkit: you need to know the route first in order to plot it! Googlemaps: select "walking" and the routes offered respect one way systems - useful if you are pushing a car along as you walk, I suppose! Traveline: does not find "on foot" destinations like Transport Direct did and the annoying "start" and "destination" search boxes do not allow you to alter routes but instead overwrite with incorrect, suggestions. Transport Direct should have been updated, not dumped! It is ludicrous to suggest that there are viable alternatives. Clearly, those responsible for this ridiculous decision never consulted or even tried to put themselves in the shoes or vehicles of members of the public, small businesses, couriers, etc. etc. who found this service invaluable and, so far, irreplaceable. I agree with all the comments, and it is my experience also that none of the suggested sites (or anywhere else for that matter) offers this facility. I have been using TD since it started, and, as a consultant (on e-government!) who needs to travel between customers across the UK in unique journeys, it was invaluable. It really does appear that this will 'drive' people to car travel, because that is the only travel medium that does have effective planners online. I live in Spain and work in UK, and used TD to plan journeys including checking which domestic airport was the easiest to travel from/to at the start and end of the journey. Also agree that it is clear no-one has looked at these comments, since no-one has responded! I also am very upset that Transport Direct has closed. Not only did it place all info in one place, it also did little things like tell you which bus, with its destination, if that was different from your destination for instance "Take First Great Western towards Cardiff Central" with maps at every level. I have used this site for years and am at a loss what to use Goggle maps is far too inflexible and not detailed enough. I think it is a disservice to have shut this sight and would love the author to give some "better" alternative that gives as much detail. Bah. Humbug. Not only has Travelline the 'recommended alternative' failed to find any buses on the route I know has them running, but you've also shut the only service I found that allowed disabled users to add extra time for connections and slow walking pace. I was gutted to see Transport Direct disappear. I used it maybe once a month and always found it quick and accurate. Some sites such as Northern Rail journey planner won't work on my Chromebook but that never mattered because Transport Direct would tell me exactly what I needed to know. It's now a nightmare trying to plan journeys and so time consuming. To get rid of something where all the info was under one roof and expect users to navigate round a disjointed and fragmented bunch of apps and websites instead is unbelievable. If under use was the reason for closing it they should simply have promoted it more. transport direct was great. I am sad it had to go. Highly successful, immensely convenient and detailed, continually demanded and used government information website ... so the government sources then decides "Get rid of it". What else could we expect from the Government muppets currently making all the decisions for this country? Thank God we'll be getting rid of Cameron and all his idiots in 2005, including the anorak brains who decided to close down Transport Direct! I am very disappointed to see this service has closed - for public transport it was an invaluable resource. I also disagree strongly with the premise of the article. As previous comments have stated there is no equivalent integrated travel planner. Google does not work - it may be fine for road journeys but if you want to include buses in your travel outside London you are back to looking at individual timetables. Why is the supply of national, integrated travel information, especially public transport, *not* the role of Government? Just how much money was saved in closing it down? Just how much did it cost to keep it updated? If you have to get rid of it for reasons of political dogma ("private sector good public sector bad") why not offer to transfer it to the open source community or a travel charity/pressure group to run. Something for 38 degrees to campaign on perhaps? This site was invaluable to me travelling around the country for my charity work.I could find the cheapest travel option and confidently travel by public transport knowing where to get on and off buses and how long the walk would be to my destination. As it is unlikely that anyone in government will read all these comments it might be an idea to email our MPs .It's not enough to sound off about this we want someone to do something!Isn't that what we are paying them for????? Transport Direct is was the only place that gave comprehensive travel information, allowing you to compare alternative routes and modes of transport. No commercial service is really going to show you competitors' services. Google might do it, but you pay with your identity. By all means, make government data [i.e. OUR data - paid for by UK taxpayer] free for other services to use, but that does not mean HMG should not take a lead when it can do things better. Also, very annoyed that this closure was not publicised, not even on the TD website. I last used the service at the end of September and there was no suggestion that it was about to close. Only found out when I came to do another search just now. Many years ago arriving in New York I asked at a desk for the Carey Limo service. The reply was "I can do you a cab". Then I noticed the Carey sign at the adjacent desk. The person I had asked was not about to pass up a possible sale by directing me to a competitor. The public wants information it can trust, and rightly or wrongly people believe that the information provided on gov.uk sites is as far as possible correct and with no commercial bias or filtering. This makes it a priceless brand to be built on, not dismantled. Digital Strategy? Wasn't that a job on W1A? An alternative website has told me there are no buses in a 12 hour period when i can see them driving past. A comprehensive integrated website for public transport (including where to walk from/ to) just isn't something available elsewhere. I have to agree. TD was money well spent, making public transport available and connected. I wish it would be reinstated. 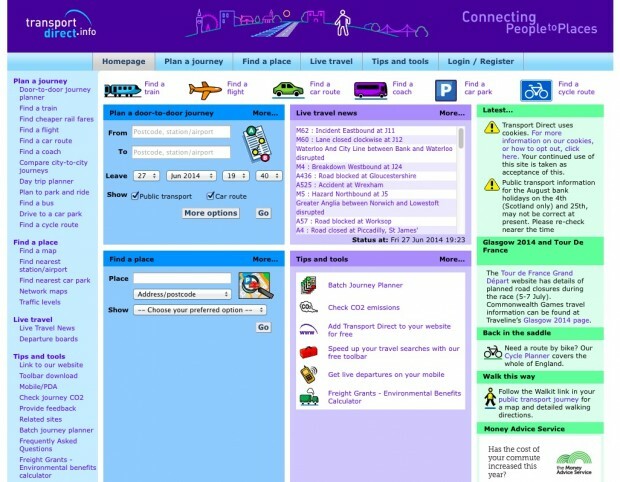 This was an utterly brilliant site that I used to use all the time. I could be anywhere and know how to get to another place by bus, train or other forms of transport. It was invaluable and really helped to promote taking alternative means of transport other than my car. I've been looking everywhere for an alternative, particularly to bus travel. If you are in a strange place you knew how to get home or some other place with this app and it always worked. By removing this site it will promote more people using their cars and less using public transport. I know it will me anyway. An extremely useful website that I'm really sad and a little bit annoyed the government couldn't continue. I really wish who ever thought this would save some money would reconsider. What a patronising post. 'Government should only do the things that only government can do'. Transport Direct did have overlap with Traveline ( I hope you clever people don't close that as well) but was good for national travel, internal air travel and comparing car journeys to long distance train trips. The route maps were great and really useful in finding places and it seems that many people will miss the find a place feature. I used TD once or twice a month and it was really helpful when I needed it. Sorry mate - government should provide services to its citizens that make life better for us all especially as the private sector clearly can't. Your nihilism and condescension are depressing. I just tried to look up a journey for today -which I know is two buses only but i need to know times - and Google maps told me there are no options. Great, thanks a lot tories. As far as I can see, there is no equivalent service to this excellent site. Living in a fairly rural area, it was invaluable because I could plan my journey using several means of transport, eg home to railway station, change of trains, transfer to bus to my destination, in one go (this was a regular journey, and I could check all stages for any changes). Please tell me where I can find a site that will do that! I am very, very disappointed that it has closed and I hope there will be a re-think. I liked this site as I used it for planning train journeys. It was the only site (that I could find) that showed the originating station and the end of the line station. For a particular service that I used this was very useful as it would indicate to me the type of train running on that service and therefore a proper 1st class area rather than a dingy few seats on a Thames Turbo. Does anyone know of another service that shows all stations on the service you select rather than just your own start and end? I was really disappointed to find that the TD site has been closed. I am retired but have used the TD site frequently to plan trips by train and bus. Giving the time of each journey, the links to a different bus or train was really helpful. I don't drive so the RAC and AA sites are useless. I clicked on all the other sites but could not find out the information I wanted. None of them present the information as well as the TD site. Please bring it back and pass it on to someone else who will maintain it. I agree with (most of) the comments made so far that this is a retrograde step. I also found the TD site especially useful and am sad to see it go. There is no alternative one-stop-shop and the rail planning sites and apps leave at lot to be desired. I also relied on the Find a place feature. ! Finding a house just by its name and the village it is in can be almost impossible! Being able to look up an exact map location from the TD website was an absolute godsend. Google map does not do that. Even the Ordnance survey getamap does not do that. So how exactly have the government opened up the data when they havn't even passed this info on to the Ordnance Survey . . ! Yes journey planning can probably be done in other ways but the ability to properly identify a destination address in a rural environment must have been saving hundreds of tonnes of CO2 emissions by stopping couriers and delivery drivers from getting lost. The Governments needs to rethink this decision. Maintaining an accurate location database for every property in the country and making that database searchable by the public without restriction or cost is a job that only government can do. ! So re-instate the TD website. Get rid of the features that were not used and get some web advertising revenue so that it can be kept self financing. If you won't do that then at least give the Ordnance Survey the data so that it is still publicly available. . . . .
Like all other small business users in the parcel and delivery service this was the best in its class for locating houses in the middle of no where. another boo boo, finance saving driven by non users, when it could have made money. It was a really good 'one stop' service. I was very sorry to see it end. Encouraged people to use public transport and walk because one could quickly work out alternatives to the car, or see when car was the only sensible option. There is nothing to compare to this site. The government should find the funds to keep this going. Invaluable service to those who use public transport daily in areas they are not familiar with. I am a Transport Planner and am disappointed that Transport Direct has disappeared. We have used it extensively over the years and have found the information to be pretty accurate, particularly when it comes to journey times which to my mind is pretty crucial. Most of our journeys require us to be somewhere by a specified time and our two satnavs tend to be too optimistic - TD was much more reliable. As others have pointed out there is a lack of alternatives that provide information of all modes. I have just tried Google, and while the graphics look good, it took a lot of hunting to be able to specify my time of travel and I couldn't find any information on car parking beyond a single sponsored link. I am a subcontract courier who delivers in rural areas in North Wales. Transport Direct was invaluable in locating certain properties.I used it every day. None of the sites recommended by the Dept of Transport go near offering the same service.The number of parcels not being delivered ie Unable to Locate as increased massively. Yeah this is a bit of a retrograde step. I too used it on a regular basis for planning business travel. There's just nothing else that does door-to-door public transport planning. A good example of Britain inventing something very good, then forgetting about it and neglecting it, instead of continuing to develop it and champion it until it was bringing in lots of revenue (perhaps via adverts, in this case). I'm sorry to see the end of a really helpful service. Don't know where to look now. England is now pretty much the only EU country without such a service except for new members. Any other clues how couriers can find addresses that are not named. The find a place option was an invaluable tool to find houses, many that do not have names on show. Does anyone know of a similar website that shows the actual address rather than just the post code. Royal Mail does a similar job but is no where near as accurate. My job has just become much harder. I am in the exact same situation as you. I am having to knock on doors, asking where such-an-such house is. I used the 'find-a-place' feature on a daily basis as a courier, so now my job has become a lot harder too. The Royal Mail website is utterly useless. This is a retrograde step. The so called alternatives do not give all the information needed in one place . The Transport Direct site was very good for doing long distance public transport journeys that cross over the regional boundaries used by Traveline. This has made planning journeys much more difficult. I think the site should be taken over by another operator. There really are not any equivalent sites. Thanks, but I'll stick to Google Maps.. At least that's had a lot of stuff plugged into it by transport providers and it's up to date..
As others have said, there is currently NO service that does what Transport Direct did. This article is simply false. The use of the past tense is misleading too. This wasn't like Ceefax. It was being used by people up until it closed, because there was no service that did quite what it did. So my life has got that bit more difficult; while other European countries are now creating services just like TD, we close it. Instead of closing it down, perhaps government should have offered it up to another organisation to run it as a service? Because Sue Giles' point is very valid - all the information in one place. I am disappointed to see this site close as I found it really helpful. I have just used Google maps to try to find the best public transport route from Chorley to Newcastle but it didn't give me details of local trains. I don't seem to be able to get all the information I need in one place any more. "As it turned out, the rest of the world made a bunch of transport planners and searchable timetables and ticket-buying apps that were far, far better than anything government could have done." As an end-user of Transport Direct, and of most of the other services listed in https://www.gov.uk/government/news/transport-direct-website-closes-on-30-september-2014, I have to take issue with this. As Matthew mentions, it worked really well for public service journey planning. If we (government) couldn't afford to upgrade the front-end to meet today's expectations, that's another matter. But back to "far, far better than anything government could have done" - is TFL.gov's journey planner another rubbish government product? I don't think so. I travel by public transport around the country and none of the 'alternative' services does a nationwide door-to-door or postcode to postcode service that covers purlic transport and walking properly. I do not need a local transport planner. I do not need yet another driving route planner. I do not need to rely on trains, I can use buses too. I needed - and regularly used - a comprehensive integrated public transport route solver. So when I needed to get to a tutorial a few weeks ago I was disappointed to find transportdirect.info had gone. I ended up phoning the 'local' travelline numpty who had clearly never set foot in the UK in his life and had no idea that Arriva trains were on strike. It took him over ten minutes - including talking to colleagues - to give me an incorrect route to an inappropriate destination in Manchester. When I needed to attend a professional meeting in London last weekend I could find no online service that could do what traveldirect.info did. In desparation, I ended up hiring a car and driving there. I assume it remains government policy - as it has been since the 1930s - for people to use a car, not mass transit systems. I'm really, really cross about this unannounced stupid inconvenience. what about the 'find a place' feature, which was invaluable to the courier driver searching that hidden house name? I am a courier driver too, and I used this feature EVERY DAY. Now I am at a loss at work, having to knock on strangers doors asking where such-an-such house is. The Royal Mail website is utterly useless as it just links you to the location of the post-code, not the house you are searching for. I am pretty annoyed this feature has been taken down. I am a courier controller and used this site daily for drivers that couldn't locate a house name \ number. Using the comma in the search to show the exact location of a house was a fantastic tool. Is there any other sites that offer this service? The most recent data is 3 years old. Are the commercial services really using that data? The transport data linked to (the annual accessibility snapshot) hasn't been updated since 2011. Transport data nowadays is the TNDS, which is available from http://traveline.info/tnds.html - which is provided by Traveline, not the Department for Transport. It looks like Gov UK have just made Couriers and other delivery drivers jobds much much harder. I'm really excited to inform everyone who has visited this page that we've successfully launched an alternative of transport direct for the people of Manchester. Our website http://manchesterbuses.co.uk lets you plan your journey by bus within Manchester at the moment & we'll be launching all of the UK cities very soon.